We are hosting a 5 day strength and conditioning program for mid-school and high school aged kids during President’s Week. Schools are off during this week. We are planning to start a teen program in March and want to gain interest early as well as show what we offer. The cost for the week is $20 per kid. There is a sheet on the front desk if interested. Please share with any friends or family. This class will be held at either 12pm or 1:30pm depending on the age group. There will also be no open gym during these classes. The CrossFit Open is just over one week away. The teams are set, the shirts will be in by early next week. If you have not paid cash, your card on file will be charged. +5 Points for one male and one female “spirit of the open” each week. +5 Points for the team with the best attendance for the week. +1 Point for 3rd Place RX Athlete, Scaled Athlete & Team each week. 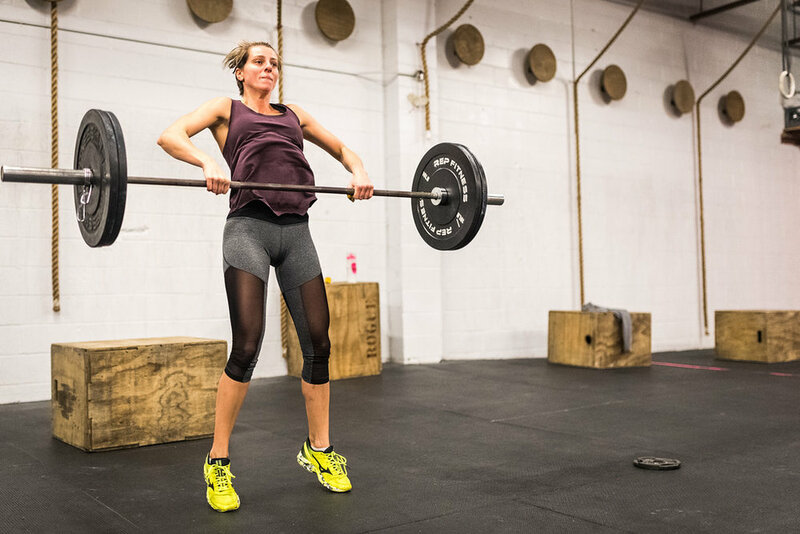 +2 Points for 2nd Place RX Athlete, Scaled Athlete & Team each week. +3 Points for 1st Place RX Athlete, Scaled Athlete & Team each week. -2 Points for re-doing a workout. If you can perform a workout RX, you should do the workout RX and not scaled just to be advantageous to your teams score. You may not judge your significant other. It’s also preferred if you judge a member of a different team. There is a coaches meeting this Saturday at 12:30pm. We start the week by getting into the fundamentals of kipping. January's focus was on strict gymnastics and that was an excellent way to prepare for what we like to do in workouts, especially with the open approaching. The kipping pull-up or any kipping gymnastic movement is desired by most members when walking in the gym. We want to make sure everyone understands the required strength and mobility standards to perform the kip with as little risk for injury as possible. The strict work, single arm high pulls, and understanding engaging the lats and shoulder in a hang position are essential to keeping the body safe when moving to the kip. Our lunges this week are lighter and are superset with high box jumps. We have had high box jumps in the program before. Remember, this means to literally jump high. We want to land as high as possible. It's not just about getting the feet just high enough to land. The workout is a chipper style that will challenge the grip and legs a bit. Use a weight for the step ups that will allow you to go unbroken. If you have c2b pull-ups, it's a great time practice them for the open. Today we are training strength, power, stamina, balance, coordination, flexibility and accuracy. Today's program is pretty simple and straight forward. The strength is something we have been working on for the last 2 months or so. If you are not feeling well enough to go for a 10RM today, don't. You can do it another day. Be smart and make the right choice. That being said, after 6 sessions of deadlifting 10's, you should have a good idea what you are capable of hitting. Then, we have some row sprints in both meters and calories. If done right, these can leave to lying on the floor like last week's interval workout did. Today we are training strength, power, speed, stamina, coordination, balance and flexibility. After taxing your central nervous system (CNS) yesterday with the heavy deadlifts and hitting some uncomfortable row sprints, we start with some muscle up progressions today. This week, everyone will do level 1 of the progressions. Level 2 will be added next week for those who complete level 1 with no issue. Those who need to stay with level 1 longer will have that opportunity. This is a continuation of our strict gymnastics from January. The workout today is very upper body demanding. Every other movement is shoulder to overhead. Then we are on the bar for both toes to bar and bar muscle ups. I have thrown a lot of toes to bar in the program over the last month or so. Between strict ttb last month and a bunch of kipping ttb in open prep and some weekend classes, I expect more members to be ready for them when they show up in this year's open. Today we are training strength, power, speed, stamina, balance, coordination, accuracy and flexibility. "I Go You Go Rounds"
Did you check off the following boxes to safely cycle the bar? We are continuing to work barbell cycling a couple days a week in preparation for the open. Last week was 3-5 reps superset with a hollow body hold. This week everyone is hitting 5 reps every round. Our focus is bar path and bar speed. Make these reps look good! Then, the wod is an emom. We will most likely be doing emoms on Thursdays during the open to keep the body moving well, not be concerned with a score and managing the time of rest during each workout. The open workouts (on Saturdays) will take more out of you than you realize and we want to be rested and prepared to be successful. Our emom today is not a walk in the park. We see the battle rope, which will be used during the weeks of the open for its low risk and high reward. We are also training some db snatches today, a movement we have seen in the last two years of the CrossFit Open. Today we are training strength, power, speed, agility, balance, accuracy, coordination, stamina and flexibility. The program for Fitness is the same as CrossFit today. Fitness Members are only allowed to take class during the designated time slots of 11am and 7pm. Even though the programs are the same today, we ask you to follow this. Thanks. Your coaches will work through each level. You will stay in each level until you become efficient enough to advance. We had rope climb technique in the program exactly two weeks ago. Taking 20 minutes to literally drill footwork helped a number of members. Some learned a more efficient way to climb. Some tweaked how they climb and felt more comfortable. Everyone can use more practice. We will have the same progression as last time, only some of us should be able to move through the first couple progressions a little quicker. The partner wod has a time cap. This should dictate how the reps are broken up and what level of intensity is needed on the row and bike. Remember to follow through on the ball slams. It is easy to see and hear when the movement is being lazy. So if needed, keep those reps to sets less than 10. You should be able to hold onto the kb for sets of 15-20 swings. Today we are training strength, power, speed, balance, coordination, accuracy, agility, endurance, stamina and flexibility. Today’s class program is open prep for everyone.